Striker Likers: Win Free Striker Season Tickets! The Sun-Sentinel has been so kind as to start a little prize giveaway running through March 28, 2011. Three prizes will be awarded, it seems all including free season tickets to the inaugural Fort Lauderdale Strikers season. All you have to do is login and say who your favorite soccer player is. It's that simple. No points will be awarded for randomness of player. I'm thinking about putting Marcelo Carrera, forward of the ASL/APSL Championship Winning Striker side of 1989. He also was my Thomas Rongen Soccer Academy Coach. I play favorites. 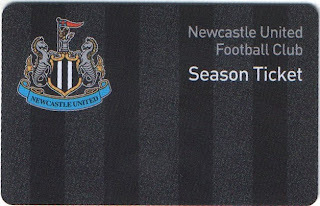 Pictured above is a sleek season ticket option from Newcastle a few years back. Wonder what these Strikers will do?